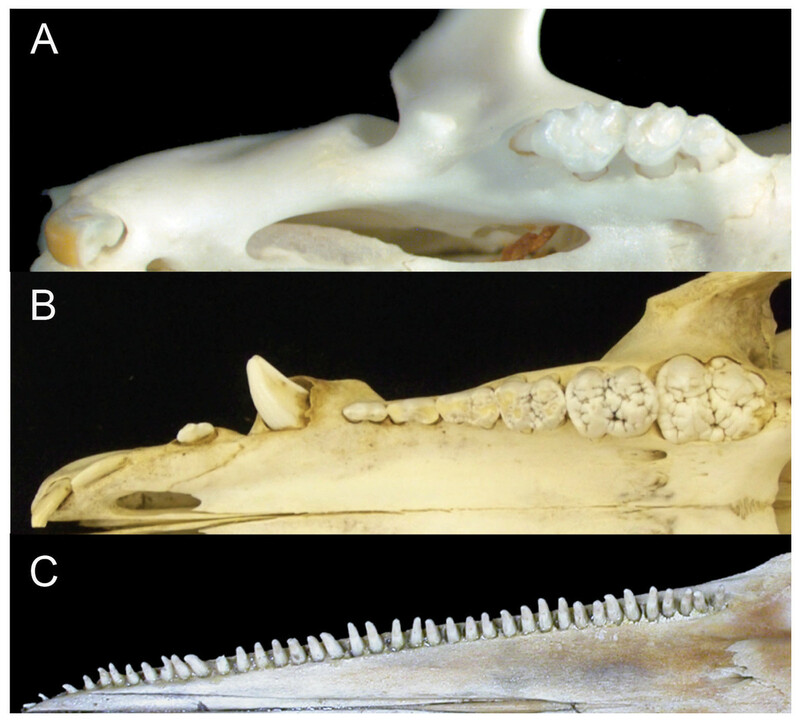 Comparison of mammalian dental patterns showing the differences in regionalization of tooth morphology. (A) Mus musculus (B) Sus scrofa (picture is of an immature pig with an unerupted M3) and (C) Stenella attenuata. Figure 1 from Armfield et al. 2013. Hi folks, Matt here. This is a ridiculously busy week for me, for reasons that will become clear by the end of the post, so I’m bundling some news items. First, my dissertation–which has been freely available online since 2007 anyway–is now on arXiv (link). Just in case the meteor takes out both me and WordPress but leaves arXiv unscathed, or possibly some outlet will let you cite arXived works but not “unpublished” ones. It was fast, easy, and free, and you should do the same with your (completed!) thesis or dissertation. Matt Cobley just posted his MS thesis, “The flexibility and musculature of the ostrich neck: Implications for the feeding ecology and reconstruction of the Sauropoda (Dinosauria:Saurischia)“, which is very timely and important work, and which you should go read right now. Mike and I cited both Matt’s thesis and my own diss. in our recent PeerJ paper, and the bibliographic entry for my diss. includes a link to the copy posted on my CV page, but arXiv links would have been simpler, faster, and probably more stable over the long run. Oddly enough, in the first proof the citation of my dissertation was removed, presumably by an automated process, since (a) PeerJ does allow citations of theses and dissertations–we checked, and (b) we suspected that already, because our citation of Matt Cobley’s work survived unscathed. Anyway, we just wrote back and asked them to add it back in, and they did–which has consistently been our experience as PeerJ members, and indeed as human beings: it’s often a pleasant surprise how much you can get just by asking nicely. Speaking of PeerJ, the second batch of articles arrived today, 10 this time, including one on the evolution of whale teeth (see image at top). And, as I threatened to do last week, I used PeerJ in the classroom today, in talking with the MS students about how peer review works. Not only did it feel fantastic to be able to point the students to a whole bunch of published examples of peer review “in the wild”, but I got some good questions and comments after class. I don’t pretend to be nonpartisan about PeerJ. I think it’s the greatest thing since sliced bread. But frankly it didn’t take much selling. The interface is so intuitive and puts so much info at your fingertips that it feels very un-journal-like. What it feels like, in fact, is the first outlet (I almost said “journal”–how 2012 of me!) designed from the ground up to take full advantage of the web (feel free to quibble, PLOS fans, but I’m standing by that), and the students get that right away. Finally, I’m giving a couple of talks here on campus later this week, and if you’re in the area and not already bored to tears by my yammering on about inflated dinosaurs, you should come by. First up, Thursday at 5:30 at WesternU’s Pumerantz Library is my family-friendly, “Flip-top heads, air-filled bones, and teenage pregnancy: how the largest dinosaurs got so big”. Then on Friday in Compatriots’ Hall in the Health Sciences Center (HSC–southwest corner of Palomares and 2nd St. in Pomona) is my more-technical-but-hopefully-not-forbiddingly-so college seminar talk, “Pneumatic bones and giant dinosaurs: an update on 5 more years of research”, or as I call it, “Thanks for giving me a job in 2008, here’s how I’ve been earning my keep”. That’s all for now–gotta go polish those talks! 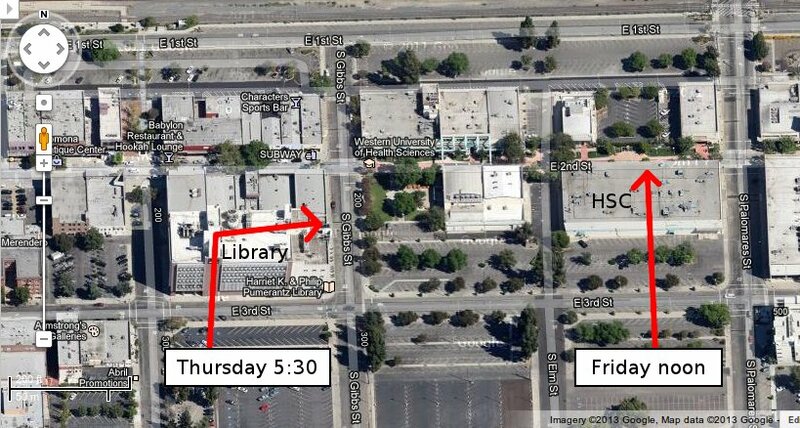 How to get to my talks, if you’re not familiar with the WU campus. Red arrows show you on what sides of these giant square buildings to find the entrances. For the library talk, walk through the front doors and BAM! you’re there. For Friday’s talk, go left around the staircase and into the nice conference room just past the atrium. Be warned, almost all the lots you can see in the satellite view require university permits during business hours, and street parking may be hard to scare up on Friday. A very welcome datum: of the ten new PeerJ papers, nine of them — all but the whale-tooth evolution paper, as it happens — have their review history online. Overall that means that 21 of the 40 PeerJ papers out there in the wild now have open review. It seems to that when the ratio is better than 50% some kind of threshhold has been crossed. It’s now in some sense The Normal Thing for PeerJ papers to have open review, and those that don’t are in a minority. This is extremely healthy. At this point, it occurs to me that my own dissertation is not on arXiv, which seems a bit stupid. Off to fix that now. Just to say, in the pig figured in Armfield et al. (2013), not only the M3 is unerupted, but at least some of the premolars are also decidual ones (P3 and P4 for sure). They could at least have chosen an adult specimen. Come on, everyone else who has a thesis or dissertation! Get them posted where everyone can see them!